Before we get into all of the dos of denture maintenance, we’re going to touch on all of the don’ts. What’s the point of cleaning your dentures if they’re already ruined? Here are some of the biggest no-nos when it comes to denture maintenance! You might feel tempted to throw your dentures into the dishwasher for extra sanitation or perhaps use boiling water for a disinfecting umph. While this would certainly kill all of the germs, it would also mess up the shape of your dentures. 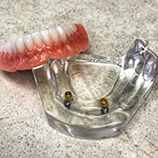 Dentures, while durable, aren’t designed to withstand extreme temperatures and super hot water will essentially deform them. When cleaning, it’s better to just use luke-warm water! What’s better at whitening whites and cleaning your bathroom…bleach! It seems only natural that bleaching your teeth with some household supplies will make them glistening, clean, and white, but it’s actually the opposite. Because bleach is so corrosive, it could weaken your dentures and ruin their color. Additionally, the chemicals could tarnish any metal in your dentures and render them unusable. Instead of bleach, opt for products designed to clean dentures safely. Whitening toothpaste isn’t all that great for normal teeth, thus making it even worse for dentures. 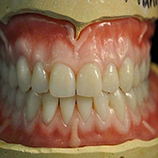 While nothing is better than a set of pearly whites, dentures are already designed to look beautiful and natural. Therefore, there is no need to use teeth whitening products on your dentures. Not only could they cause discoloration, but they could also scratch the surface if used frequently. 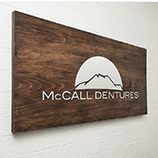 McCall Dentures guarantees that our dentures are as durable as possible. However, enough tough scrubbing on just about any surface can cause scratches and abrasion. When cleaning your dentures, be gentle. We promise that gentle cleaning is sufficient for a healthy pair of dentures!